Stokes generation wavelengths in KGW crystal with oscillation coefficient 901.5 cm-1 and Ba(NO3)2 crystal are given in the table below. 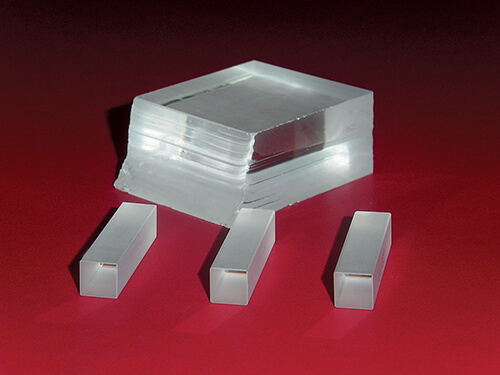 EKSMA OPTICS offers crystalline materials - Barium Nitrate - Ba(NO3)2 and undoped potassium gadolinium tungstate KGd(WO4)2 or KGW which have attracted much interest as most suitable crystals for stimulated Raman scattering (SRS). These materials can be used for frequency conversion in lasers for extending of tuning range. SRS in crystals is compatible with current all-solid-state technology and provides a very simple, compact means of frequency conversion. Thermal effects are significantly smaller in KGW. This along with the high damage threshold make the crystal an excellent candidate for power scaling. Comparing Ba(NO3)2 and KGW for Raman application Ba(NO3)2 are more effective in case of ns pulses and KGW – in case of ps pulses.